When you think of watermelon, two things likely come to mind: water and sugar. One additional thought may be how refreshing a thick slice of this delicious fruit tastes, especially on a hot, summer day. It is true that watermelon is mostly water, and it is definitely delicious. While watermelon derives most of its calories from sugar, it comes with fiber and other nutrients, making it an excellent choice as a snack. A 1 cup serving of watermelon contains 45 calories. Of these, three calories come from protein and two calories from fat, while the remaining energy is derived from carbohydrates. Watermelon also contains more than half a gram of fiber, in addition to 17 percent of the daily requirement for vitamin A, and 21 percent of your daily need for vitamin C, and smaller amounts of many other essential nutrients. 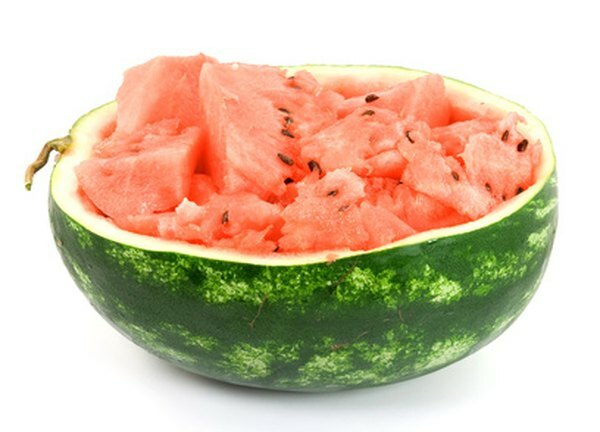 Watermelon derives nearly 90 percent of its calories from carbohydrates. Most of this is in the form of free fructose, but watermelon also contains some free glucose as well as sucrose. Fructose and glucose are simple sugars that are rapidly absorbed by your bloodstream to provide instant energy. Sucrose is also an energy source. All the sugar in watermelon may leave you wondering whether it is too much of a good thing. The glycemic index is a measure of the effect of sugar in food on your blood glucose levels. High glycemic foods make your blood sugar rise rapidly. This leads to an increase in the secretion of insulin, a hormone your pancreas produces. A diet loaded with high glycemic foods can lead to too much insulin in your blood, which contributes to weight gain, low blood sugar and eventually your pancreas's demise. What you are left with is diabetes, which is not a good thing. The glycemic index of watermelon is between 72 and 80. Values above 55 are considered high. However, watermelon has a low glycemic load, which according to Walter Willett, M.D., is a better measure of a food’s effect on blood sugar. This is due to the high amount of water in watermelon. Indeed, the fruit is over 90 percent water, and since water is calorie free but filling, you are likely to become satisfied from a meal containing watermelon before you ingest too many calories or too much sugar to pose health risks. Watermelon’s numerous health benefits are reasons to enjoy this deliciously sweet summer fruit.